Chinese students in Korea are less likely than their counterparts from other countries to work in low-grade jobs in convenience stores or waiting tables to pay their tuition. Instead they provide shopping services, work as tour guides or advertise Korean goods among Chinese buyers. The easiest way for Chinese students to make money here is to shop for buyers back in China. They buy Korean cosmetics 60-70 percent cheaper in wholesale markets and send them to acquaintances in China. Foreigners can register as business operators if they buy more than W500,000 (US$1=W1,112) worth of goods in their first transaction. Once registered, they can still buy smaller quantities at wholesale prices. They can make profit margins of up to 60 percent if they buy goods here and sell them in China at list prices. Bilingual speakers of Chinese and Korean can also make decent money as tour guides due to a surge in demand from growing numbers of Chinese tourists. 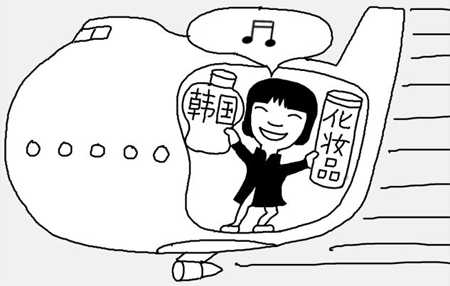 "Chinese students are highly trusted by Chinese tourists," a tour operator said. Some make money from online advertising for Korean culture and products as the Chinese market grows. Companies and regional governments are hiring Chinese students as their marketers to promote their products or local goods on Chinese social media like Weibo.